After steamrolling his way to the final without dropping a set, many felt that Cilic would have the weapons to force a contest. Nothing could have been further from the truth, with injuries and poor play preventing Cilic from ever getting a foothold in the match. Federer broke early in the first set and never looked back, winning 6-3, 6-1, 6-4 in under two hours. Even if fully fit, there was a big doubt that Cilic could have beaten Federer. Carrying a foot injury impeded his ability to provide a contest. Whether nerves played a part is hard to know but this would have been the biggest match of Cilic’s career since his maiden US open triumph many years ago. Cilic knew he had to be aggressive but he needed to work harder to rally and solidify his ground game before attacking – unfortunately, he did neither. Federer gave him multiple looks by varying his topspin shots and using the slice and this added to Cilic’s struggles. Cilic bludgeons his forehand, and hitting it very flat leaves him very little margin for error. His unforced errors flowed from both sides but particularly from the forehand wing. He briefly changed tactics to serve and volley and this did not work either. We didn’t see the best of Cilic last night, but one hopes he can back up his outstanding efforts from Wimbledon at the US Open. Perhaps this is stating the obvious but among the remainder of his majestic all-court game, this gets relatively overlooked. Federer always finds the right return – a shorter second serves provided a chance to be aggressive and he hit a beautiful off backhand in the third set. When returning the first serve, 200km/h serves are blocked back, which maximises his chance of getting the return in and he is rarely punished due to the dearth of serve-volleyers in the game. It is not as powerful as the driven returns that Andy Murray and Novak Djokovic consistently produce but no less effective, and Federer has used these tactics to see off many big servers over the years. 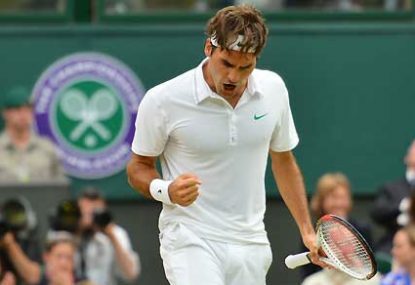 Federer’s record eighth Wimbledon title takes him above Pete Sampras as the player to have won the most Wimbledon titles. At 35 and playing some of the best tennis of his career, a ninth and tenth Wimbledon title is not out of reach. The biggest factor is health; can Federer stay fit and maintain the mobility that defines his game? If he can, anything is possible. The next set of challengers to the ‘Big 4’ seems further away than ever and at present Rafael Nadal Djokovic remain his biggest obstacles.